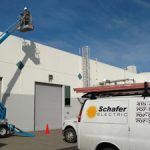 Keep your business safe with expert lighting installation services from Schafer Electric Services, Inc! 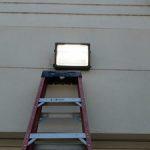 Just a little bit of light can make your business much safer. 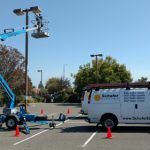 From Santa Rosa to Lake County to Marin, Schafer Electric Services, Inc can handle any lighting job—no matter the size or scope. Got a huge parking lot to light? No problem. Want to add security lights for your small business? We can do that too. We can help you with security lighting, parking lot lighting, LEO retrofits, and much more—just contact us and let us know what your lighting project is! If you want to light up your North Bay business, fill out the form below to contact Schafer Electric Services, Inc. I am very happy with Schafer Electric Services, Inc. Their prompt service and quality installation of chandeliers and ceiling can lights went above and beyond. Plus, Ben has a great personality which is important to me.